Throughtful ginger head man with beard is talking via the mobile phone at the blurred background of the building. Close-up portrait of the worried man. 4k00:14Portrait of fashion woman in a city in Europe. Young girl looking at camera. hd00:21Panorama from gifts to woman using smartphone to shopping online with credit card. hd00:26Old age people health problem concept. An elderly woman measures blood pressure and takes pills at home. hd00:11Full-length shot of the handsome fashionable man with ginger curly hair and beard keeping hands in pockets and walking along the pavement road. He is wearing trews pants and striped jacket. hd00:22Confident attractive man with curly ginger hair in trews pants and striped jacket walks at the background of the old building. He stops, looks away and goes back. hd00:15Walking stylish man with beard touching his ginger curly hair at the background of the building. He is wearing striped jacket and trews pants. 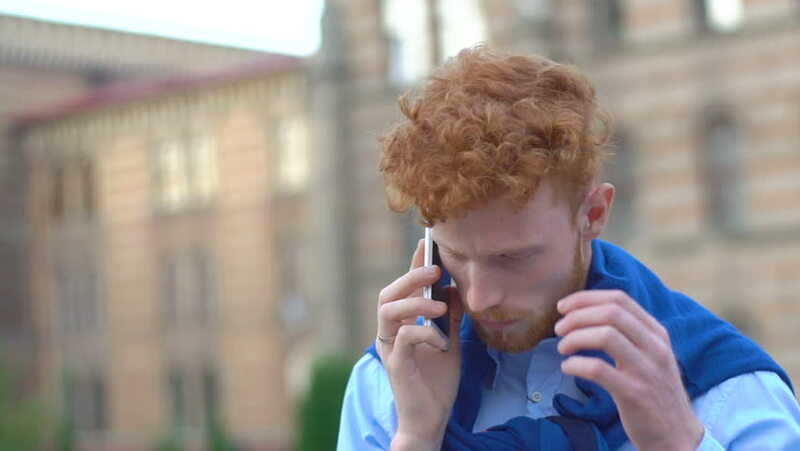 hd00:08Handsome man with ginger curly hair and beard is happily talking via the mobile phone while walking along the street. hd00:18Happy smiling man with ginger curly hair and beard talking via the mobile phone at the blurred background of the building. hd00:15Portrait of the depressed man with red hair and beard talking via the mobile phone outdoor. hd00:10Attractive confident ginger head man with beard is talking selfies via the mobile phone outdoor.